Newly built in 2010 and located adjacent to the Put-in-Bay Resort & Conference Center. Put-in-Bay's newest hotel offers the absolute best location on the island, just one block from the main downtown strip. Each 4-5 bedroom, 3 bath villa rivals the best lodging found in Key West and other island vacation rentals hotspots. Put-in-Bay Villas opened their doors in the Spring of 2010 as the Put-in-Bay Ohio'spremier group lodging facility. Our deluxe 3-story Villas sleep up to either 8 or 12 adults and are great for family vacations. Each fully-equipped villa features a full size refrigerator, freezer with ice maker, microwave, wet bar, kitchenette, 50" flat-screen TV with cable, living room, 4 bedrooms with queen size beds, and 3 full baths (one per floor). 12-person villas feature 5 bedrooms (4 with queen size beds and 1 with 3 queen beds) and three full baths and are equivalent to a rental home. Rivaling the best hotels, homes, and luxury condos. The first floor has an exterior villa-style patio to enjoy the warm summer air and lushly landscaped courtyard. There is a view of the award-winning Blue Marlin Tiki Bar & Grille pool area with swim up bar across the street and the world's largest hot tub seating 40 people. The second floor features a veranda overlooking the same. Pool access is complimentary with your stay at Put-in-Bay Villas. 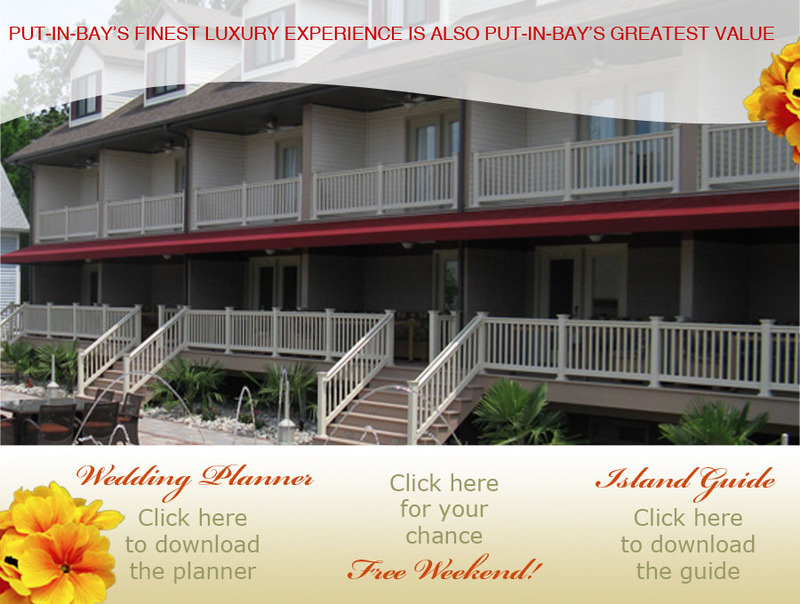 Guests of the Put-in-Bay Villas enjoy full access to all amenities of the Put-in-Bay Resort. This includes a complimentary continental breakfast every day but Saturday, where guests enjoy a poolside breakfast brunch. Golf Cart, Bicycle, and Moped Rentals are located on site. Put-in-Bay Villas also features the islands only gym facility. Tanning beds are available for a fee.